Spotify Connect added to Samsung's wireless multi-room speakers | What Hi-Fi? Samsung's range of wireless speakers, which made their debut at CES 2014 in Las Vegas earlier this year, have become the first multi-room speakers to sport integrated Spotify Connect. 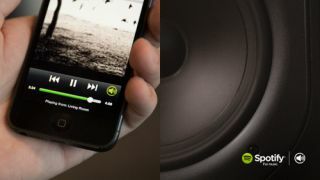 The announcement means that – provided you have a Spotify Premium account – you'll no longer be required to stream Spotify using another device, and can instead stream direct from the Spotify's cloud servers on the Samsung speakers. All you'll need to do is hit play on your smartphone or tablet and Samsung's M5 and M7 speakers will do the rest, streaming your favourite songs and artists – or playlists – from Spotify. Samsung's range of wireless multi-room speakers can be used alone or with other devices such as a TV or Blu-ray player via a wi-fi connection to create a multi-room audio system. The speakers are controlled from a downloadable app, offer plug-and-play installation and also come with NFC functionality in order to make it easier to pair up your speakers and devices. Available as individual speakers, the M5 (£230) and M7 (£330, above) speakers are similar to the Sonos Play:3 and Play:5 and pose a stiff challenge to the American firm's grasp on the multi-room market. And Samsung isn't the only manufacturer to eye up the wireless speaker market this year, with a wide range of systems coming to the market in recent months – such as the £895 Naim Muso. For those on a slightly more restricted budget, we've also seen the Denon's HEOS multi-room system and Simple Audio's Roomplayer+ unveiled. It looks likely to be a major growth area in 2014.